We woke up excited to have a good friend and her daughter come visit and play with us all day today! It was so nice to hang out and chat while the kids entertained themselves, yes, I really don’t have many friends here. We got a good laugh watching “Pitch Perfect” (my 4th time) while our little girls were taking their afternoon nap and my 4 yr old boy did his ‘quiet time’, more like movie time, with us. We went to the park after their nap and after our movie to run the kids around and use up some of their energy. But before we left, we did the vegetable prep that way we could just throw the ingredients together after we got back So dinner tonight was Korean Japchae and bulgogi with lettuce that you wrap up with rice and a spicy bean paste. Oh, and on a side note, my 9 month old daughter just started waving “hi” and “bye” and can also shake her head when we shake our head. Except she moves her whole body while she’s shaking her head with extreme gusto. She is so cute and I could just eat her up! Her little chipmunk cheeks are to die for. I wish she would stay this happy and unrebellious forever! 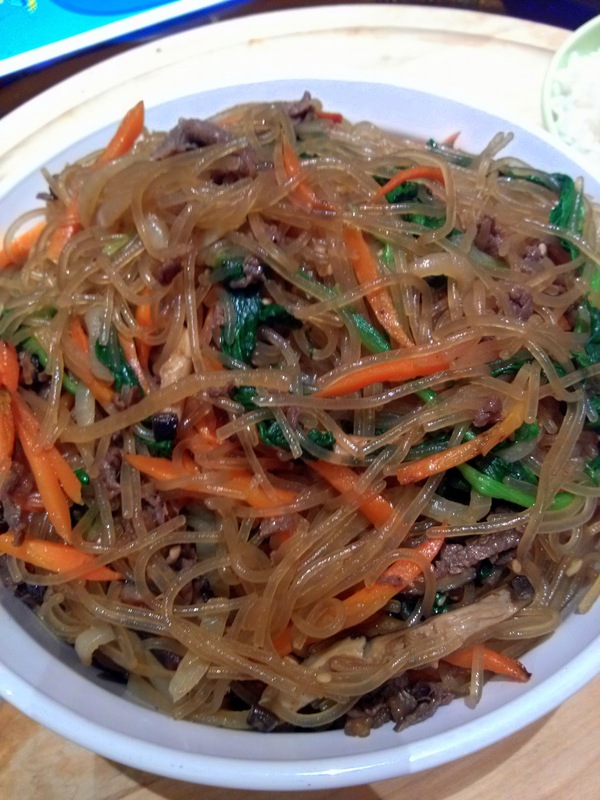 And back to our subject: Japchae is a very well known and popular Korean noodle dish that is different from other “noodle” dishes because instead of it being a main dish in a meal, Koreans use is as a side dish to be eaten with rice and other side dishes. I think rice is Korean people’s main dish in every meal. It’s always there, oh, and kimchi, can’t forget our mealtime staple. Serve up a plate of lasagna and my dad will ask for rice and kimchi to go with it. A meal just isn’t a meal without rice and of course if there’s rice, there needs to be kimchi. 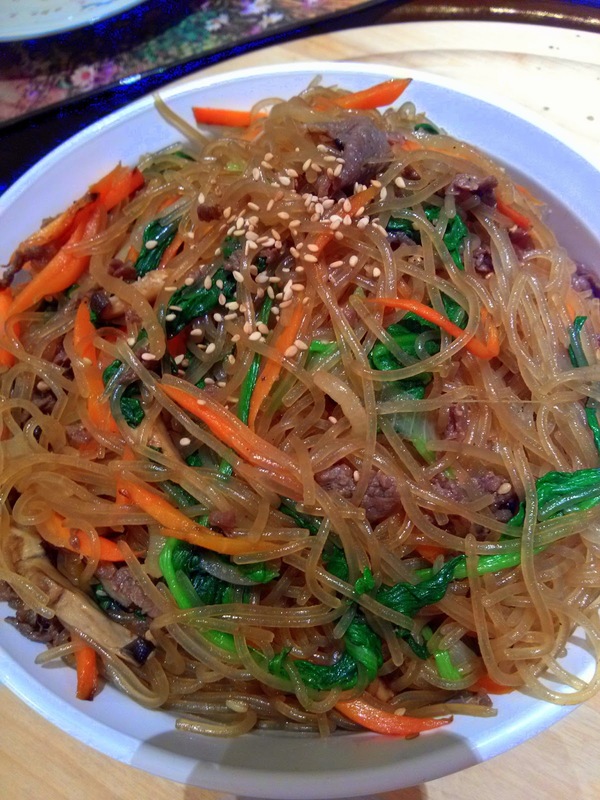 Many Korean restaurants will serve japchae as a side dish with their Barbeque meats. It’s fairly easy to make other than the fact that it has quite a few steps for prep. I normally make Japchae without a recipe and without using any measuring cups or spoons so when my aunt (on my husband’s side) asked me for a recipe, I obviously couldn’t give it to ber. So this time, I used measuring cups and spoons to measure how much of each ingredient I was adding so I could share it with everyone. As with all recipes (usually non-baking), I think it’s a good rule of thumb to use your instincts and taste as you go so you can add more or less seasoning according to your taste. 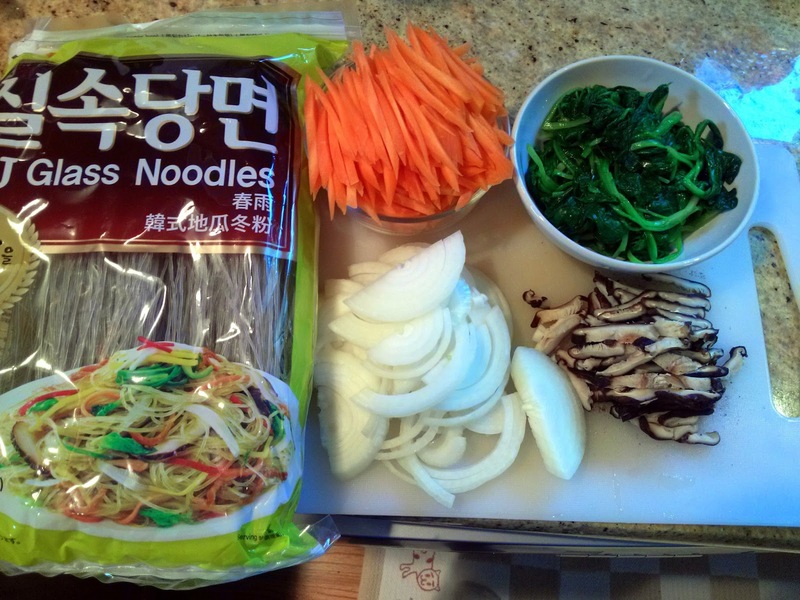 1 pack Korean dried glass noodles (sweet potato noodles) about 1 lb. *you can omit the beef for a vegetarian version. Just add a little more of the vegetables, like another carrot or two and some more spinach or add zucchini and cook it with the other vegetables. ** If you are using regular soy sauce, add just the 1/3 cup soy sauce to begin with and add more as needed. 2. Bring a medium pot of water to a boil and blanch the spinach for a few seconds until it withers then drain and gently squeeze excess water. Add a 1/4 tsp of salt, 1 clove of garlic, minced, (or I use a garlic press), a 1/4 tsp sesame oil and mix. 3. Bring a large pot of water to a boil and cook the glass noodles for about 5-7 minutes. Test it by tasting the noodle for doneness. It shouldn’t be hard. Rinse under cold water and drain. 4. Put the noodles into a large mixing bowl and add most of the soysauce and brown sugar mixture to the noodles and mix well. Taste and add the rest of the soysauce mixture if needed then add the 2 TB sesame oil and mix. A food service glove, like the one pictured above, comes in very handy. 5. 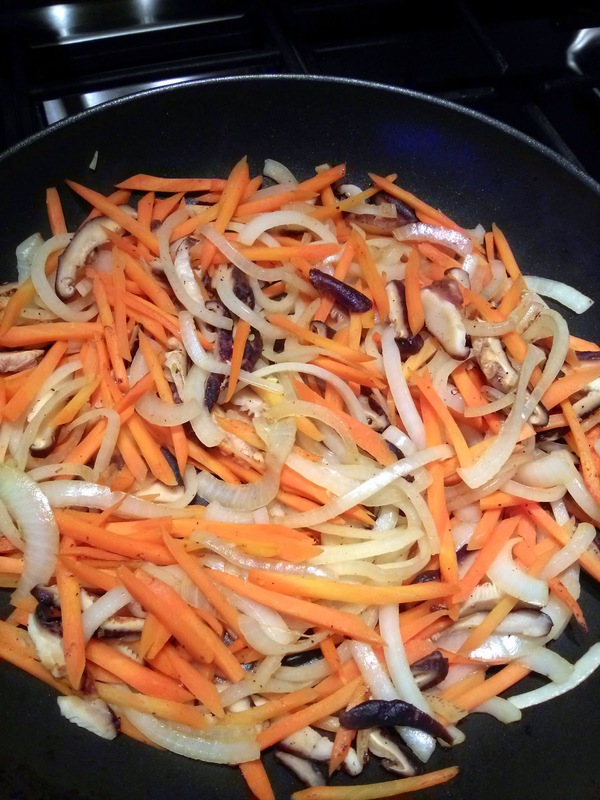 Add a tablespoon of vegetable oil to a hot wok or large pan and stir fry 1 minced garlic clove (again I use garlic press) then add the carrots, saute for a minute and lastly, and add the onions and mushrooms. Add 1 tsp salt and a little pepper and stirfry until the vegetables are cooked, but not soggy and overcooked. Add the vegetables and the seasoned spinach to the noodles and mix. 6. Using the same pan, cook the meat, adding some salt and pepper if the meat is not marinated. Again, you may omit the beef if you wish for a vegetarian dish and just add some zucchinis to step 5. Add the meat to the noodles and mix. 7. 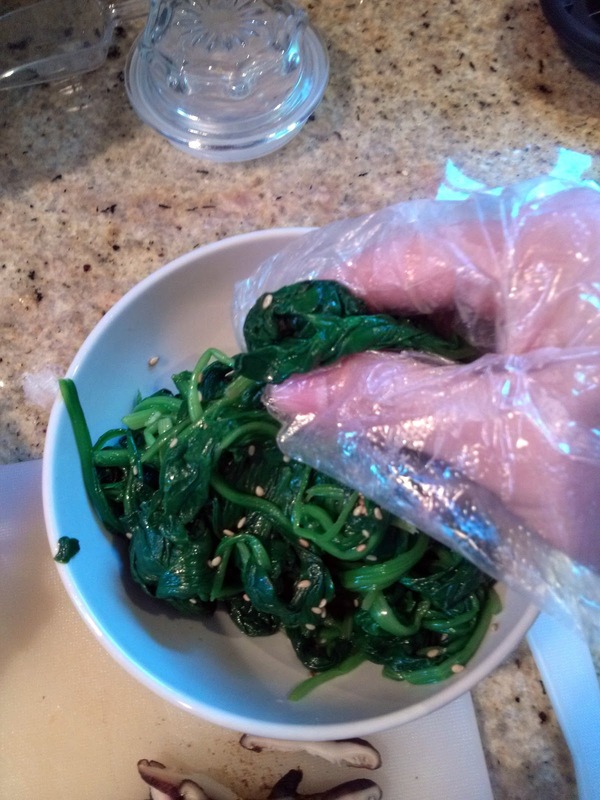 Mix the noodles well using your gloved hand and taste. Add more soysauce or brown sugar according to taste. Add some sesame seeds and mix, then sprinkle some more sesame seeds to the middle when serving for a pretty presentation. Yay! This looks great flora~ You're amazing. mmm looks yummy. I wanna make!